SAINT AUGUSTINE – Readings from the book series “The Adventures of Charlie Pierce” by Harvey E. Oyer III will be spotlighted Dec. 1 at 11 a.m. at Lewis Auditorium of Flagler College, Granada Street. The event is free and open to the public. Planned are a lecture, meet and greet and book signing. 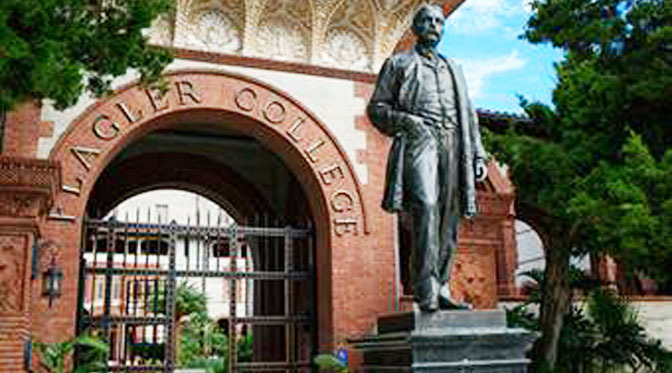 The event is hosted by the education department at Flagler College. The readings will be performed by education department faculty and students, as well as Susan Joyner, retired school teacher and wife of Flagler College President Joseph G. Joyner. One of Susan Joyner’s passions is children’s literature. In preparing for celebrating the college’s 50thanniversary, she wanted to contribute in a meaningful and fun way that included not just Flagler students, but students of all ages, countywide. She knew of Oyer’s work for many reasons, one being that Professor Emeritus Dr. Thomas Graham reviewed one of the books in the Charlie Pierce series. “I sincerely hope Mr. Oyer’s inspiring lecture will encourage the students in our area to want to learn more about Henry Flagler and Florida history,” she said. For those who pre-register, at 12:30 p.m. the event moves to the Solarium for a Chick-Fil-A lunch, activities and additional readings. This portion of the day’s events is also free. The event was scheduled for a time that made sense for families to attend following the annual St. Augustine Christmas Parade downtown. In addition to Saturday’s activities, the education department has organized readings for fourth and fifth graders at various schools in St. Johns County including Webster Elementary and the Florida School for the Deaf & the Blind. Harvey Oyer III is a fifth generation Floridian and has loosely based his series on his family’s ancestral stories. Oyer is a Cambridge University graduate and avid historian. He currently lives and works in West Palm Beach, Fla. “The Adventures of Charlie Pierce” series has won numerous awards. This event is the last one for the semester in a string of others scheduled to celebrate with the community the college’s 50th anniversary. Other events will take place starting again in January with the Alumni Baseball game on Jan. 19 at 1 p.m. at Drysdale Field. For more information regarding this event or to pre-register for the lunch and activities, please call Stephanie Burgess at (904) 826-8572 or email collegerelations@flagler.edu. For more information about the free, public events taking place in celebration of the college’s 50th anniversary, visit www.flagler.edu/flagler50.